Tonight’s Impact will be headlined by the renewal of vows between Mr. & Mrs. Jarrett…again. Jeff & Karen attempted to go through the motions twice last week, and the second time, I was under the impression that their vow renewal was completed. TNA sees things differently, as the couple will try to reaffirm their love once more, this time with Bart Scott as the special enforcer. 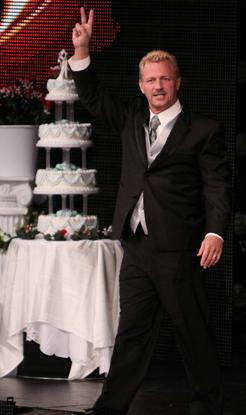 I miss when wrestling weddings were simpler affairs. Some ruffies, a trip to Vegas, a devastated Canadian in the ring, and everybody went home happy. In addition to the ceremony, Impact’s main event will see the new World Champion Sting team with Rob Van Dam to take on the make-shift team of Jeff Hardy & Mr. Anderson. Jeff’s brother Matt will also be in action when he meets “The Phenomenal One” AJ Styles in a street fight. In a 6-Knockout tag team match, The Beautiful People & Winter will take on Cookie, Sarita, and MTV’s Angelina Pivarnick . The feud between The Pope and Samoa Joe is set to continue tonight, as the two will meet one-on-one. The #1 contenders to the Tag Team Titles, Ink Inc., look to prepare themselves for their upcoming championship match by taking on Generation Me. Lastly, after an entirely too long hiatus of one week, Madison Rayne will return to Impact tonight to issue another one of her open challenges. Score.